I live in Japan and got to see this movie in theaters the day it released. I am currently studying Japanese, and I'm not even at the JLPT N5 level yet. But I still went to see it with obviously no subs, and I enjoyed every second of it! Non Non Biyori was the perfect movie to go see without a grasp on the language because the story-telling is so easy to follow due to visuals and characters. While there is really no "plot" in the movie, you shouldn't expect that if you've already seen the two season of the original series. The girls and friends go on vacation to Okinawa... they eat, they kayak, they snorkle, and they swim. And that's it. The movie is meant to be JUST as feel-good as the series was. The production was very engaging (it had to in order to keep my attention as an English speaker) and very fun for anyone who loved the original show. I also teared up a bit at the end, because Non Non Biyori has always brought a certain innocence and charm that touches my heart. TL;DR: If you are a Non Non Biyori fan, you have to watch this. If you hate slice of life anime, I don't recommend you to watch this. I own and have read all the mangas up until volume 12 (which is the most recently released one) at the time of writing this review. The manga itself is super good, but this movie made the contents even better than the manga. This is not saying the manga is terrible or anything, in fact it's one of my favorites, but the movie went in to much more depth for the vacation chapters. It's been probably a year and a half since I read the chapters of the contents in this movie so my memories may not be 100% correct. I think most of the activities in the movies were done as like those "time-skip"/ "fast forward" panels where they just flash a scene and move on to the next in the manga, but this movie actually shows them doing these activities. Just a typical slice of life story. Travel to Okinawa and do things there. Nothing much to say here. I may be bias, but I'm a huge fan of Atto sensei's (original creator of NNB) and Silver Link's art style. The style is just like all the previous NNB anime. Oh, background art is beautiful as always. Really captures the nature. The animation is great too, I didn't see any bad animations watching it in the theatre. No complaints on sounds either. Just like the previous NNB, they share similar style of music and BGM. I didn't hear anything that wasn't fitting. The OP is sang by nano.RIPE and still has the same chill and relaxing theme as the music they sang for NNB before. ED is sang by our 4 main girls and it's super cute! This is why I love this show so much! Everyone is just so lovable! For this movie specifically, I felt that they focused on Natsumi the most out of everyone else. She got more screen time than any other character but not so much that it makes all other characters irrelevant. (Her screen time is cause of her relations and interactions with the new character that is introduced in this movie) You still get your super cute Renge and Koma-chan moments and oh, I found so many parts of the movie just making me and the audience around me in the theatre giggle. Pretty much all the comedic moments hit their marks. The character interaction is great as always! I found myself smiling so much during the movie and I can feel the joy in the theatre. Having already read the manga, I knew what I should be expecting content wise, but after watching the movie I really felt like it blew the expectations off the roof. It was so much more than I could ask for and I would definitely go rewatch it again if I have the time for it! Gonna grab the BD for sure when they announce it! This brings me back to my point in the beginning. If you are a NNB fan or a slice of life lover, you have to watch it. If you hate slice of life or has no interest in them, I really don't recommend watching this movie. 4 years after being stranded on the plane to Okinawa, the girls have finally landed! To understand the position I was in prior to watching this, I had booked an early ticket that came with early goodies just for this, having came back from a Non Non Biyori themed pilgrimage to Ogawamachi in Saitama. Waited in line in the cinema in Ikebukuro all giddy and hyped myself to no end just before watching this. Then I heard the seiyuu had a fan meeting in the cinema in Shinjuku. Then I actually watched the film. Vacation is the continuation of the Non Non Biyori first season OVA where Onii-chan won tickets to Okinawa before being forgotten and left to the background. A new edition to the cast, Aoi, presents herself to the film. A polite and formal girl, she serves as a foil of sorts to Natsumi, whom she’s of the same age to. Unexpectedly, the relationship and contrast between the two serves as the core pillar to the film, providing a very human drama to unfold as the film goes on. I actually found myself to be engrossed in their relationship and found it to be the highlight of the film. It calls to mind Ren-chon and Honoka’s episode from Season 1, though not as perfectly executed. Still, while the resolution to their relationship is somewhat unsatisfying, the final shot of the film (well almost final shot) ended their arc in a heart-warming fashion. The visuals of the film made it a truly spectacular experience to behold in cinema. The Okinawan scenery is breathtaking when viewed on a large screen, making for a change in scenery from the grassy farmlands from the main series. One scene in particular I won’t spoil had the whole theatre agape in awe as it played out, being absolutely striking in terms of its execution and buildup. The soundtrack and audio design too do a spectacular job of accentuating key moments like these, making these scenes stay memorable in your head. The comedy is fine. Not relying too much on established jokes or running gags from the franchise is a plus, and Hikage’s antics are too funny to pass over. For the most part, the comedy is not the main focus of the film, and serves to bridge scenes over to each other, so the low-key nature of the comedy is fine for what it is. It won’t have you laughing all that often, but you’ll have a smile on your face throughout. Personally not a fan of Hotaru’s obsession with Komarin as with the main series, but it didn’t bother me too much here. The main problem I have with the film is its lack of focus, especially in the beginning. While ostensibly about the relationship between Aoi and Natsun as a product of the vacation taken by the gang, their relationship isn’t given nearly the prominence I would have liked in the film. To be fair, it’s a relaxing slice of life film at heart, and its goal is mainly to put your mind at ease and heal your woes, so alternating between the other main characters isn’t much of a detriment as you may think. My verdict? It was alright I suppose. Perhaps one shouldn’t hold too much expectations coming into this. It’s ultimately a very relaxing film with some comedy moments sprinkled throughout, but nothing that’s worth going truly out of your way to watch. 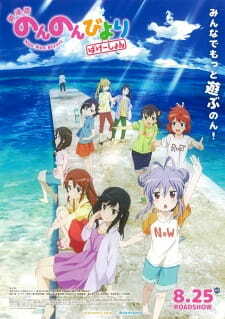 While the film did develop in aspects I was not expecting it to, it doesn’t change the paradigm of the Non Non Biyori framework nor does it truly challenge the medium, but what it is is an enjoyable hour or so of Okinawan scenery. It’s a very peaceful film that will put you at ease. I have looked forward to Non Non Biyori: Vacation for quite some time, and I am pleased to report that it stacks up very well against the original series. Continuing from the season 1 OVA, it follows the Asahigaoka group as they travel to tropical Okinawa for a summer vacation. NNB has never held a large focus on narrative, and neither does Vacation, but this is by no means to its detriment. Instead, an essentially anecdotal story is told as the girls explore Okinawa and enjoy themselves. The new setting does not bring any changes to the series’ established structure, and its pacing provides the same mood, ensuring that a few brief laughs are had and that everything remains calming and enjoyable. Renge, Natsumi, and all other main characters from the original series return, and it’s great to see more of them. Additionally, Aoi, the daughter of an Okinawa hotel owner, joins the group as a newcomer. Her interactions with the group were fun to watch, and I especially liked her friendship with Natsumi. Hopefully she will reappear in any future material. Coming in, the film does expect viewers to know who the characters are, and they are not introduced individually. Given its short runtime, this is not unexpected, but watching NNB’s first season before jumping into Vacation so that you are familiar with the group definitely enhances the experience. This is where Vacation truly shines. The original series’ art was impressive enough, but the film’s increased production values have provided truly spectacular landscapes that accentuate its relaxing aesthetic. From the streets of Okinawa, to the forest rivers, and to the beach, everything is finely detailed, colorful, and a pleasure to look at. Background objects such as waterfalls feature more vibrant animation, which helps to increase realism. Side note: if you’re in the market for some new scenery-based desktop backgrounds, look no further than this film. There isn’t much to discuss in the sound department, as it’s perfectly serviceable. The OP and ED are upbeat, and the soundtrack itself is well-composed and fits NNB’s laid-back nature, but ultimately none of it was too memorable. The seiyuu gave excellent performances as always. Non Non Biyori: Vacation is an relaxing visual treat that all fans of the original series will enjoy. It likely won’t win over viewers who aren’t already fans of aesthetic-based slice-of-life anime or CGDCT shows, but for those of you who do enjoy the genre, it’s a short and sweet adventure that’s definitely worth 70 minutes of your time.